ABSTRACT: This paper discusses the circumstances that drew William Crotch into a highly specific and systematic compositional procedure, and describes how the severe material and procedural restrictions of his Introduction and Fugue on a Subject of Four Notes, no others being used all thro' the movement (ca. 1830) nevertheless permit the creation of a successful musical work on both intellectual and artistic scales. The analytical focus of the article is the manner in which Crotch establishes and deploys a varied content through a coherent and developmental design despite the self-imposed limitations. William Crotch (1775–1847) embraced probably the all-time ebb in English musical composition, from the late Georgian era through the first part of the nineteenth century, a transitional era caught between conflicting values: after the decline of the ancient regime of Handel and J.C. Bach, but before Mendelssohn had provided a focal point around which the new spirit of the romantic movement could flourish in Victorian England. The most precocious musical prodigy in recorded history, Crotch rose meteorically to the highest ranks of the musical establishmenton the basis of his astonishing talents, but never attained comparable heights as a composer. He was playing public concerts at the age of two, touring from three to nine, assistant to Dr. Randall, Professor of Music at Cambridge at twelve, Organist of Oxford Cathedral at fourteen, Bachelor of Music at nineteen, and Professor of Music at Oxford at age twenty-one. (3) His music in general possesses all the technical requisites of greatness, but the expression of an inspired imagination rarely shines through. Today only a handful of his compositions are heard with any frequency. As Professor of Music, Crotch promoted a systematic approach to musical aesthetics derivative of contemporary English theories of the pictorial arts. (4) Crotch was, after all, a highly gifted landscape artist and a close friend of Constable. Essentially music could be considered according to three categories, sublime, beautiful, and ornamental. Sublime comprised the lofty sacred works of Bach and Handel, while “pure sublime” distinguished the prima pratica of Palestrina, Byrd, and Gibbons. (5) Beautiful music encompassed the expressive style of the baroque, exemplified by the instrumental music of Corelli and by opera seria. Much of Handel combines the sublime and the beautiful. The ornamental included music of an eccentric nature, whether in rhythm, harmony, modulation, etc. ; music designed to provoke an immediate reaction from the listener, but not necessarily to have lasting value. Haydn was judged by Crotch as a composer who succeeded in combining the beautiful and the ornamental. Crotch was an academic, and he became increasingly interested in the theoretical and speculative aspects of the art at a time when personal expression was growing in importance. (6) As Crotch progressed towards a more severe and pious philosophy in his later years, his work increasingly assumed charachteristics of his sublime aesthetic. Fugue and chant became the focus of his interest in music, and, like Webern, Crotch became increasingly interested in miniature composition. He excelled at the simplest forms and devoted much of his energy to writing hymn tunes and Anglican chants—simple melodies of ten or twenty notes harmonized in chorale style. According to Rennert, Crotch’s view was that “the way to re- introduce the pure sublime into modern music was to study ‘the mysteries of canon, fugue and imitation’, and then imitate the sixteenth-century sacred style in original compositions. . . . sublimity ‘does not strike and surprise, dazzle and amuse, soothe and delight’, as does the ornamental. Instead it ‘elevates and expands the mind’”. (7) Regarding the Well-tempered Clavier, Crotch noted: “The fugue in the major key of E (Specimens of Music, Vol. iii. p. 1.) is perhaps the best of the whole.”(8) (See Example 7). Interestingly, Crotch’s Fugue on a Subject of Four Notes resembles Bach’s fugue in its copious use of stretti and diminutions. We might note that it was similar strict procedures that characterized to a high degree the compositional techniques of the second Viennese school. Indeed, one is tempted to expand the aesthetic argument to the point at which pure mathematics, as demonstrated through the serial procedures of Babbitt and Boulez for example, becomes the new “sublime” style of the 20th century, as it primarily gratifies the mind rather than the senses. The Introduction and Fugue on a Subject of Four Notes is itself an exercise in reduction to minimal content. Introduction & Fugue/On a Subject of 4. Notes, no others being used all thro’ the movement/Composed for the Piano Forte or Organ,/by/Wm. Crotch. Mus Doc./Professor of Music in the University of Oxford & Principal of the Royal Academy of Music London./London, Pubd. at the Royal Harmonic Institution, Argyll Rooms, 246 Regent street by Welsh & Hawes,/Music Sellers by special appointment to his Majesty, Their Royal Highnesses the Dukes of York,/Clarence, Sussex & the Duchess of Kent, & to be had at all the Music Warehouses in the United Kingdom. While Crotch held the post of Professor of Music at Oxford University from 1797 until his death in 1847, he was Principal of the Royal Academy of Music only from 1822 to midsummer, 1832. (11) Other works of Crotch issued by the same publishers, Welsh & Hawes at the Royal Harmonic Institution, span the identical period, 1822–1832. (12) Thus, we can be confident in dating the composition to the period 1822–1832. (13) Only in the case that Crotch retained the title Principal of the Royal Academy of Music after his resignation, can we date the composition in the period 1833–1847. Secondary evidence that narrows the date even further, but which is perhaps less concrete, is the fact that this composition does not appear in the list of Crotch’s published works as appended to the Substance of several courses of lectures on music, “to be had at the Royal Harmonic Institution, Regent Street”, first published in 1831. (14) Thus, barring the accidental omission of this piece from the list, we can only date its publication as 1831–32. The introduction is a simple affair, the purpose of which is merely to propose the subject and establish the tonality. The tempo indication is by Crotch’s standard method, the length of a free-swinging pendulum. Sixteen inches is about 104 beats per minute. However, this should indicate the tempo of the quarter note, not the eighth note, as the music suggests. Curiously no pendulum designation appears for the fugue. 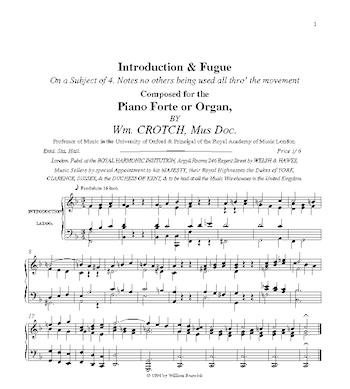 Crotch himself provides a motivic analysis of the fugue using carats of four sizes, as shown at the bottom of the first page of the fugue (see mto.94.0.10.renwick2.gif). Note that retrogrades are never used. The reason for this should quickly become clear, for the introduction of retrogrades would confuse the compositional plan, by admitting virtually any pattern that utilizes stepwise motion. Also, statements of the motive are never conjoined—that is no note is used twice, as the final note of one statement and the initial note of the next—except in one location, the connection of measure 52 to measure 53. Finally, what is perhaps obvious but is mentioned here as a significant distinction compared to atonal and serial techniques, statements of the motive are always presented melodically, that is within the context of a single part of the four- or five-part texture. One might think that Crotch’s own analysis provides a fairly complete explanation of the piece, but it really provides only one level of motivic analysis. It shows very clearly the derivation of all the notes, but it does not really address how this plethora of statements of the motive, some 290 in total, combine to form a convincing artistic whole. In this paper I attempt to provide a second level of motivic analysis that addresses this problem directly. There are therefore really two levels of motivic structure; the basic one shown by Crotch, and the more complex one which relates to issues of structure and form. For the purposes of this discussion, it is useful to make a distinction between the motive, the basic idea upon which the piece is based, and the fugue-subject, a particular form of the motive employed at a particular transposition and developed in a formalized manner. It is not improper, I believe, to consider the motive as a true Grundgestalt, for Crotch’s utilization of the motive follows very well the principles of transformation and development that are implied by Schoenberg’s concept. Indeed, this is the means by which Crotch is able to create variety and coherence within the formal pre-compositional constraints. The motive is a rising third followed by a descending step, presented in equal note-values. This motive is among the smallest conceivable motives upon which such a composition can be based. The continual stepwise motion which this motive exhibits is a necessary condition to permit sufficient freedom in the construction of contrapuntal combinations. That is, linear motion is capable of interpretation as passing and neighbouring dissonance, whereas leaps generally imply only consonance, and are therefore comparatively limiting. (16) Three notes in a step-wise relationship are not enough to establish a unique contrapuntal motive. If such a three-note motive were wedge-shaped, it would be incapable of asserting retrograde formations. Likewise, a uni-directional motive—a scale-segment—is incapable of asserting any distinction between retrograde and inversion. (17) These cells, however, combines a leap and a step in the opposite direction, a possibility not readily accommodated by the requirement of stepwise motion here. I will designate the motive as any statement of any permutation of the four-note group, whether transposed, inverted, augmented or diminished—note that Crotch never uses the retrograde. (18) Thus the motive is the general idea behind the composition, whereas the subject and various countersubjects that I will identify are specific formations of the motive. The subject itself is the simplest possible expression of the motive, beginning on the tonic in half-notes: F–G–A–G. Once the motive is expressed in actual notes, it assumes a tonal aspect. In essence the subject represents a rise from 1ˆ to 2ˆ, implying a basic harmonic motion I–V (see Example 1). The third note, then, can be taken as a reaching-over which forms a harmonic consonance with the f, while the second note forms a passing tone. It is most unusual that a fugue-subject end on a weak beat, as this one does, but this is an important condition for the counterpoint, as will become clear. The subject, then, is an incomplete linear motion, suggesting a continuation with either f or a. F would close the thought, resolving the motion back to 1ˆ, while a would complete a rising third-progression, in which the g of measure 2 would operate as a passing note. In the music, measure 3 provides both notes. While most fugue subjects express a complete tonal motion, in this case the lack of such completion is actually necessary to allow any degree of freedom in the construction of progressions. These tonal interpretations of the subject are borne out by the Introduction, which in 3/4 time places the harmonic motion and metric emphasis on the first and last notes of the subject. In the Introduction, the rising linear implication is realized through a sequential ascent. Further statements of the motive as half-notes, beginning on various scale degrees, will be considered transposed repetitions of the subject. The answer, naturally, denotes the subject transposed to the fifth of the operative key. It is the distinction between motive and subject made here that allows the possibility of creating out of the motive one or more countersubjects that simultaneously provide contrast and unity in the composition. Crotch creates three recognizable countersubjects, each based on a different of species of strict counterpoint (see Examples 2–4). Countersubject 1 (CS1) denotes the quarter-note form of the motive (first species) normally beginning on the second quarter, and normally using the inversion, i.e. A–G–F–G in measure 3. Note that the rectus form of CS1 uses the inversion of the motive. The inversus, CS1i, uses the prime form of the motive. This distinction, while somewhat awkward, is by no means trivial or artificial, for it is central in establishing a diverse content from the motive. At the quarter-note rate, two statements of the motive are necessary to provide sufficient length to accompany the subject, and to create a full statement of CS1. In this new rhythmic form, the final note of the motive occurs on a strong beat, allowing its tonal importance to be expressed. CS2 denotes the syncopated form of the motive in half notes (fourth species) normally also using the inverted form of the motive, and capable of a combination per arsin et thesin (at the distance of one quarter-note) with the subject. CS3 denotes the eighth-note form of the motive (third species) beginning on the weak part of the beat, and normally using the rectus form, as if to provide further distinction to CS1. However, CS3 is not systematically deployed. Rather, its function is to provide linking and harmonizing material and textural contrast to the more systematic utilizations of S, CS1, and CS2. In three instances the motive appears in whole notes (see Example 5). Due to their location and role in the formal process, they can be considered simply as augmentations of the subject. In terms of the present analysis, Crotch’s analytic labels identify all the statements of the motive. His Subject inverted in diminution, I define as CS1; his subject in double diminution, I define as CS3. CS2 is of course is the subject inverted, but on the off-beats. Therefore it is not distinguished in Crotch’s analysis. It should become clear that the ultimate success of this composition is dependant entirely on Crotch’s very careful establishment of a range of well defined and contrasting thematic materials from the single motive. The subject, in its normal and augmented forms, follows the metrical plan, always beginning on a strong beat, while the diminution and double diminution of CS1 and CS2 provide an arsis characteristic. This dichotomy is extremely important to the contrapuntal working of the composition, and it is the success of these definitions that allows a larger coherence to pervade the music. The challenge then is to organize the materials in such a way that a sense of form, contrast, development, and unity can be established. It is just as much the means by which Crotch limits his materials, as the means by which he exploits the range of possibilities, that gives coherence and sense to the composition. It follows that since all the material of the piece is created from statements of the motive, invertible counterpoint will play an especially important role in this fugue. It would be an interesting exercise to explore all of the possible contrapuntal combinations of rectus, inversus, diminution and augmentation, and stretto, and it is likely that Crotch worked up initial sketches for the composition in that manner, considering his general propensity towards contrapuntal combinations. Due in particular to the stepwise nature of the motive, the number of contrapuntal combinations available is extremely large. An exhaustive listing of possibilities is unnecessary; certainly the composition itself illustrates the range of possibilities available. In order to explain the manner in which the various thematic transformations combine to form a coherent whole, I will adopt for the following discussion a narrative-analysis that explains how the various parts relate to one another. Readers should follow the score (Figure 1) as well as the chart of sections given in Example 8. The subject (S) occurs in the tenor. At the entry of the answer in the alto, Crotch establishes the crucial distinction of materials as described previously by creating CS1 out of a chain of diminished inverted motive-statements, and beginning on the second quarter, so that the final note of each statement coincides with a metric strong point. Therefore the accompaniment to the answer portrays a contrasting melodic profile and a contrasting rhythm—this is essentially the means by which Crotch is able to create structural distinctions among the motivic statements, and thus to permit the development of a form with some depth. In the first part of the piece, the subject occurs only in rectus, while the CS1 statements use only the inversus form of the motive. The bridge before the third entry is created out of a statement of CS1 in the alto, accompanied in parallel thirds and tenths in the tenor. Construction of a bridge in this manner, out of the countersubject, is a venerable method that gives the semblance of canon at the outset of the piece. Here too, the continued use of CS1 provides for a contrast to the music of the following entry, without introducing new material. At the statement of the subject in the soprano in measure 7— below the alto—Crotch does not continue with CS1, but instead introduces CS2, the suspension figure. Continued use of only S and CS1 throughout the exposition would have proven tedious at a very early point in the fugue. Again, to contrast with the thematic character of the subject, CS2 uses the inverted form of the motive. At the fourth entry, the answer in the bass, CS3 appears for the first time. As well, CS2 appears again in the soprano. Thus the exposition systematically fulfils the formal objective of stating all of the thematic materials, S, CS1, CS2, and CS3, while projecting a continual growth of rhythmic activity and textural density. Apparently, measures 10–15 serve essentially as a development of the subject, exploring a variety of ways in which the subject can interact with itself in stretto, however, using only the rectus form. Rather than setting the exposition off from later entries, the first stretto overlaps with the end of the fourth entry. During this passage, the only other accompanimental material is CS3, first presented in rectus form, then in inversus (CS3i), and then in a variety of rectus and inversus forms. The introduction of CS3i is quite important here in allowing the necessary flexibility of the accompanimental parts as they harmonize the stretti. 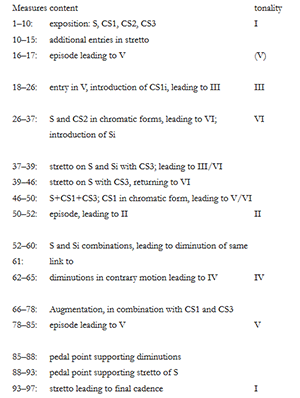 In measures 16–18, CS3 and CS3i are played out in relation to one another, providing a brief episode in V that separates the stretto passage from what follows. At measure 18, S in V (accompanied by CS2 in the soprano) provides the basis for a modulation to III as VI of V. Here Si appears for the first time, in the tenor. However, this statement of Si should not be considered a significant event in the motivic development of the piece, but only a convenient accompanimental inner voice. Only later does Si appear with a significant formal connotation. Following S in the bass at measure 18, the bass continues by reintroducing CS1 against A in the alto. This simple reintroduction of CS1 prepares for the next significant transformation; in measure 24, CS1 appears for the first time in inversion against itself: CS1 in the treble, and CS1i in the bass. This new formation is followed immediately by its own inversion: CS1 in bass accompanied by CS1i in soprano (itself harmonised in parallel sixths with the alto on CS1i). A PAC on III at measure 27 (A minor), created from free statements of CS3, heralds a new passage in the upper register, constructed of alternations of S and Si, in each instance accompanied by CS2. This passage, therefore develops the idea of stretto per arsin et thesin as it projects an intense chromaticism through a broad descending sweep in measures 27–37, leading to VI (D minor). The statements of CS2 beginning in measures 31 and 36 introduce a new form of the motive, consisting entirely of semitonal motion. measures 37–45 exploit a new configuration; S and Si working against sequential figures composed of CS3 and CS3i. At measures 46– 49, CS1 is added to the mix, but now it too is presented in semitonal motion. Following another episode (measures 50–52) based on forms of CS3 and CS3i, and leading to II (G minor), S is combined directly with Si, at the tenth, octave, and sixth in succession, while CS3 and CS3i provided the continual running motion in the inner parts. It is at this juncture that the end of the statements of CS3 and CS3i intersect with the beginning of the statements of S and Si. The musical effect of this occurrence is elision. The following passage then prepares a climax at measures 59– 60 composed of CS1 and CS1i combined in five parts, but placed dramatically for the first time on the down beat. Its context as an accelerated repetition of the music of the previous measures makes explicit that these new forms of CS1 and CS1i arise out of the process of diminution of S and Si. Therefore this passage, which must be taken as harmonically and formally the point of furthest remove, is a synthesis of S and CS1, which were originally presented antithetically in the exposition. 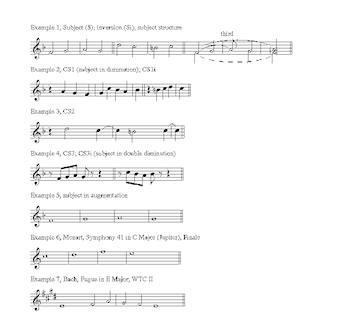 A rhetorical rest and reduction to two parts provide connections to the following passage, measures 62–65, composed of combinations of CS1 and CS1i, now beginning on beat 4, and expanding through the registers. (19) The sudden contrast at this point, and ultimate reduction to eighth notes is as close as Crotch comes in this composition to an example of the ornamental style, in ths case as an inserted parody. However, it also serves to reestablish the anacrustic nature of the following statements of CS1 and CS1i. The resolution of this passage to IV (B ) at measure 66 coincides with S augmented in whole notes in the bass. In a sense, IV substitutes for I in a kind of subdominant recapitulation at this point. The following eleven measures exploit S in augmentation, traversing the registers from bass to soprano in the manner of the D minor fugue of Well-tempered Clavier I, accompanied by CS1 and CS3–CS3i, in a very fine triple-counterpoint. At measure 78 the subject, inverted and augmented, occurs in the alto part, but this should really be understood as an augmentation of CS2, since its function is as a counterpoint for a statement of S in augmentation. Measures 80–84 provide for a suitable episodic transition to the pedal point on V as more and more instances of CS3 and CS3i develop a tension that resolves on V at measure 85. The pedal point begins with a descending 6/3 series of CS3i that spans the fifth progression G2–C2 and reduces the tension of the previous measures. At the final instant in measure 87, CS3i appears in the intervallic diminution of semitones, representing conceptually the ultimate reduction of the motive, both intervallically and durationally. We can state this idea in set-theoretical terms as a systematic reduction from 0–2–4 at the outset to 0–1–3 and its inversion, 0–2–3 in the minor-key sections, and finally 0–1–2, the chromatic formeasure This passage also echoes the music of the pedal point at the end of the Introduction, providing a satisfying connection of the two movements, and strengthening the imperative to resolve what was unresolved at the end of the Introduction. The pedal point itself is fully integrated into the motivic structure. Its beginning is the final note of a statement of CS3, and later the same note becomes the first note of the final stretto series. At measure 94, and for the two following measures, the motivic structure finally breaks—as is truly a necessity, for there is no means of creating a traditional PAC out of the strictly stepwise motion of the motive. The bass becomes a functioning root progression, 1ˆ–5ˆ–1ˆ, and the upper voices provide the traditional falling cadence. The upper voice itself presents S, after which only one additional note, F1 provides the conclusion with the absolute minimum of digression from the motivic material. Just as important to the motivic structure as the systematic combination of motive forms is the avoidance of certain combinations. We have already noted the complete absence of retrogrades, explained by their lack of provision for any really new material in comparison to their potential for increased confusion in the identity of motivic forms. Also, Crotch never combines CS1 and CS2. CS2i never appears, just as Si rarely appears, except as a direct contrary motion accompaniment to S. CS1i occurs only as an inversus accompaniment for CS1 (rectus). The only exception is in measure 70, where it accompanies S in augmentation and can therefore be construed structurally as CS3 in augmentation. Si in Augmentation only occurs in arsin et thesin form, relating it specifically as an augmentation of CS2. S in augmentation never occurs in combination with S or Si, probably since that would call into question whether the focus of the passage is S or the augmentation of S, and whether S was really CSi in augmentation. The fatal mistake which any novice would have made in such a composition would have been overemployment of possibilities. It is Crotch’s selective use of materials that allows him to build a coherent form. In Free Composition, Schenker argued against special contrapuntal devices for their own sake, as artificial, non- organic means of creation. (20) Crotch’s work is artificial in the sense that the restrictions that Crotch imposed potentially hamper the free development of tonal materials and voice-leading progressions. But on the other hand, the entire composition is predicated on such constraints. And Crotch achieves an integral balance of motive and structure in that it is entirely the motive that determines the possibilities and limitations of the piece. Example 9, a middleground structural analysis of the fugue, illustrates some of the significant tonal events, and in particular attempts to demonstrate how the mass of motivic detail resolves into a coherent tonal picture. 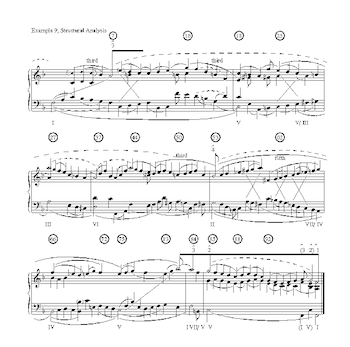 To be brief about the contents of Example 9, The fugue actually displays by and large a classic tonal structure for fugue, as it projects a single broad tonal progression throughout its length. However, in some of the details the peculiarities of the composition show through. The bass line in particular displays somewhat less of the tonal clarity associated with a typical Bachian fugue. See for example, the passage from measures 37 to 44. On the other hand, the middleground level of structure provides strong fifth progressions in the bass that are not possible on the conjunct surface. See for example the cadential progressions leading into measures 18 and 27. The upper voice projects a very clear Urlinie from 3ˆ— that is very clear within the genre of fugue, which by nature is problematic—expanded by the upper neighbour, B , and consistently broadened by coupling of lower and upper octaves of the principal upper voice notes, in a manner reminiscent of Bach’s Fugue 1 in C Major, Well-tempered Clavier II. In fact, this registral coupling is one of the principal means by which the fugue attains a sense of controlled forward direction towards the ultimate conclusion. Considering the simplicity of the motive and the excellent control of tonal structure which the fugue displays, it comes as something of a surprise that the fugue does not contain any hidden statements of the motive that can be considered significant. One can, for example, take the principal notes of the Urlinie in the upper register, A2–B –A2–G2, as a giant augmentation of the motive in retrograde, but it is not easy to support such an interpretation as having any significance other than the realization of the imperatives of the tonal system. It is only a result of the postulates of the Urlinie as linear, and in this case embellished by an upper neighbour. Rather, in this piece, it seems that the proliferation of surface instances of the motive in four distinct magnitudes actually works against the perception of hidden motives at higher levels. In contrast, the free treatment of the motive in the Introduction seems naturally to lead to motivic expansions, such as the Bl–Al–G l–Al form of the upper line in measures 8–12. In a work such as this one, where the compositional parameter of monothematicism is so rigidly predetermined, a major problem is the differentiation of primary or expository material from secondary, transitional, or developmental material, in order that the composition can generate a classical sense of rhetorical logic and formal proportion. It is the creative solution to this problem that shows Crotch’s mastery. In Serial Composition and Atonality, George Perle referred thus to Webern’s, Concerto for Nine Instruments, Op. 24: “Every compositional element is thus ultimately derived from a single microcosmic detail . . . ”(21) This statement admirably describes this fugue composed about 100 years earlier! Of course, where Crotch had the problem of creating a traditional tonal coherence, Webern had a different problem, that of developing a unique coherence and organization of elements. Ironically, it is partially his premature musical development that caused Crotch to develop an aesthetic of music that was outdated by the time he reached his maturity, and he was unable to retool the aesthetic of his formative years to reflect a new set of musical values. Not until the twentieth century did such academic composition again become appreciated for its special qualities. In his lectures on musical aesthetics, Crotch stated: “If a fugue be a barbarous invention, unworthy of an ingenious composer, let it be omitted altogether. But I should rather say, it is one of the most interesting of all kinds of movement, resembling the discourse of a great orator, who, having chosen his theme, states it clearly; examines it in all its bearings; views it through all its changes and varieties of aspect; and, in conclusion, by recapitulating the whole, stamps his argument strongly on the mind.” (Substance, p. 101) At the outset of these same lectures, he stakes out his ground with a general principle: “Music is both an art and a science.”(22) There is no better testament of his commitment to this principle than his Introduction and Fugue on a Subject of Four Notes. measure 1: the tempo indication should refer to the quarter note, not the eighth note. measure 15, beat 3: E 2 was E 2.
measure 26, lower staff: natural missing on B.
measure 28, upper staff beats 2–4: the University of Alberta print is illegible and has been inked over by hand. However, the motivic context makes the reconstruction plain. measure 29, upper staff: tie missing to the first G2. measure 32, upper staff: sharp missing on F1. measure 32, lower staff: whole rest missing. measure 49, upper staff: natural missing on D2. measure 96, upper staff: dot missing on C1. B: ANALYTICAL MARKS: In some cases an inversus is marked as a rectus and vice versa. In other cases an analytical mark is omitted. measure 5, upper staff: SDi is marked as SD. measure 6, upper staff: SDi is marked as SD. measure 13, upper staff: SDDi is marked as SDD. measure 13, lower staff: SDD is marked as SDDi. measure 14, lower staff: SDD and SDD are not marked. measure 17, upper staff: SDD is indicated on the first eighth, not the second. measure 22, upper staff, SDD is missing. measure 41, upper staff, SDD on the second half is marked as SDDi. measure 44, lower staff, SDD on the second half is marked as SDDi. measure 49, lower staff, SDD is omitted on the second half, lower part. measure 51, upper staff, SDD is missing on the second half, lower part. measure 68, upper staff, SDDi on the second half is marked as SDD. measure 74, upper staff, SDD on the first half is marked as SDDi. measure 75, upper staff, SDD is missing. measure 75, lower staff, SDi is missing. measure 83, upper staff, SDD is missing for lower part, second half. measure 83, lower staff, SDDi is missing for lower part, second half. measure 88, lower staff, S is missing. measure 91, upper staff, SDDi is missing—twice—for lower part. The University of Alberta copy contains inked-in suggestions in the fugue only for performance on the organ with pedals as indicated below. It is most unlikely that these annotations reflect Crotch’s manner of organ performance, for there is no recorded mention of him using the organ pedals. The markings likely date from the mid-nineteenth century, the period during which the pedal organ quickly gained popularity in England following Mendelssohn’s important visit of 1829.
measure 9: “Ped:” marked at the bass entry of S.
measure 15: “Man:” marked at the F2. measure 18: “Ped:” marked at the bass entry of S.
measure 25: “Ped 8ves:” marked at the F.
measure 33: “Ped:” marked at the bass entry of S.
measure 38: “Man:” marked at the tenor entry of Si on D1. measure 40: “Ped 8ves:” marked at the bass entry of S on F.
measure 42: “Ped:” marked at the bass entry of SDD on F.
measure 48: “Ped:” marked at the G .
measure 51: “Ped[:]” marked at the D.
measure 66: “Ped:” marked at the bass entry of S-augmented. measure 71: “Ped:” marked at the E.
measure 85: “Ped 8ves:” marked at the C that begins the pedal-point. In addition, from measures 88–91 and measures 94–95, a retained C has ben added, indicating that the pedals would retain the pedal-point C throughout these passages. Burke, Edmund. 1958. A Philosophical Enquiry into the Origins of Our Ideas of the Sublime and Beautiful (1757), ed. J.T. Boulton. Oxford: Oxford University Press. Crotch, William. 1986 Substance of Several Courses of Lectures on Music. London: Longman, Rees, Orme, Brown, and Green, 1831. R/with an introduction by Benarr Rainbow. Clarabricken, Ireland: Boethius Press. Crotch, William. 1845. Specimens of Various Styles of Music. Birchall, 1808, 2nd. Ed. Royal Harmonic Institution, c. 1822, 3rd. Edition, with corrections and additions. Cramer, Addison and Beale. —————. 1845. Specimens of Various Styles of Music. Birchall, 1808, 2nd. Ed. Royal Harmonic Institution, c. 1822, 3rd. Edition, with corrections and additions. Cramer, Addison and Beale. Levarie, Siegmund and Ernst Levy. 1983. Musical Morphology: a Discourse and a Dictionary. Kent, Ohio: The Kent State University Press. Perle, George. 1981. Serial Composition and Atonality. Fifth edition. Berkeley: University of California Press. Rennert, Jonathan. 1975. William Crotch. Lavenham, Suffolk: Terence Dalton. Reynolds, Joshua. 1975. Discourses (1769–97). New Haven: Yale University Press. Schenker, Heinrich. 1979. Free Composition. 2 Vols. New York: Longman. 1. This concept is considered at some length in Levarie and Levy 1983. 2. See the first four GIF files listed at the beginning of the article. 3. The standard account of Crotch’s life and works is Rennert 1975. 4. Edmund Burke and Joshua Reynolds both developed systematic approaches to aesthetics. See Burke 1958; Reynolds 1975. 6. In his adjudication of Samuel Sebastian Wesley’s brilliant anthem The Wilderness for the Gresham prize, Crotch’s caustic criticisms pointed to just those aspects which mark Wesley’s uniquely personal and original style and which give it a lasting value. Ironically, it is by and large Wesley’s music, not Crotch’s, that remains the more performed and more highly valued today. 9. Catalogue of Printed Music in the British Library to 1980, 62 vols. (London: K.G. Saur, 1981–87). 10. The catalogue number is M10 C65 I6 R88. It appears that a large portion of the material in this collection, which comprises bound volumes of compositions originally published separately, at one time belonged to Edward John Hopkins (1818–1901), organist of the Temple Church in London from 1843–1898. 11. Among his duties at Oxford was the unlikely one of adjudicating his own composition exercise for the Mus. Doc. in 1799. Not surprisingly, he judged it satisfactory. 12. Rennert suggests 1820 as an approximate date for the Royal Harmonic Institution’s reprint of Crotch’s popular anthem “Methinks I hear the full celestial choir”. See Rennert 1975, 101. 13. Crotch’s other published fugal works focus on the year 1825. 14. Crotch 1831. The works-list appears on pages 171–173. 15. Rainbow, Introduction to Crotch 1831, ix. 16. Frescobaldi’s “Recercar Ottavo, Obligo di non uscir mai di grado”, from Recercare et Canzoni, 1615, is a fascinating specimen of music in the strict style constructed with absolutely no stepwise motion, and therefore with no dissonance. 17. The trichords in Webern’s Concerto for Nine Instruments, Op. 24, represent the ultimate reduction of material. 18. Crotch was no doubt aware of the potential for retrograde constructions, however. His double chant in G major, is based entirely on retrograde, in the form A, B, A(r), B(r). 19. The sudden contrast at this point, and ultimate reduction to eighth notes is as close as Crotch comes in this composition to an example of the ornamental style, since the sudden reduction can easily be heard as an inserted parody. However, it also provides the means for reestablishing the anacrustic nature of the following statements of CS1 and CS1i. This concept is considered at some length in Levarie and Levy 1983. See the first four GIF files listed at the beginning of the article. The standard account of Crotch’s life and works is Rennert 1975. Edmund Burke and Joshua Reynolds both developed systematic approaches to aesthetics. See Burke 1958; Reynolds 1975. In his adjudication of Samuel Sebastian Wesley’s brilliant anthem The Wilderness for the Gresham prize, Crotch’s caustic criticisms pointed to just those aspects which mark Wesley’s uniquely personal and original style and which give it a lasting value. Ironically, it is by and large Wesley’s music, not Crotch’s, that remains the more performed and more highly valued today. Catalogue of Printed Music in the British Library to 1980, 62 vols. (London: K.G. Saur, 1981–87). The catalogue number is M10 C65 I6 R88. It appears that a large portion of the material in this collection, which comprises bound volumes of compositions originally published separately, at one time belonged to Edward John Hopkins (1818–1901), organist of the Temple Church in London from 1843–1898. Among his duties at Oxford was the unlikely one of adjudicating his own composition exercise for the Mus. Doc. in 1799. Not surprisingly, he judged it satisfactory. Rennert suggests 1820 as an approximate date for the Royal Harmonic Institution’s reprint of Crotch’s popular anthem “Methinks I hear the full celestial choir”. See Rennert 1975, 101. Crotch’s other published fugal works focus on the year 1825. Crotch 1831. The works-list appears on pages 171–173. Rainbow, Introduction to Crotch 1831, ix. Frescobaldi’s “Recercar Ottavo, Obligo di non uscir mai di grado”, from Recercare et Canzoni, 1615, is a fascinating specimen of music in the strict style constructed with absolutely no stepwise motion, and therefore with no dissonance. The trichords in Webern’s Concerto for Nine Instruments, Op. 24, represent the ultimate reduction of material. Crotch was no doubt aware of the potential for retrograde constructions, however. His double chant in G major, is based entirely on retrograde, in the form A, B, A(r), B(r). The sudden contrast at this point, and ultimate reduction to eighth notes is as close as Crotch comes in this composition to an example of the ornamental style, since the sudden reduction can easily be heard as an inserted parody. However, it also provides the means for reestablishing the anacrustic nature of the following statements of CS1 and CS1i.